As someone born in the post 80’s era, my childhood musical diet was more S Club 7 than Foreigner. So, I approached Rock of Ages with undoubtedly less enthusiasm than my mother who accompanied me. 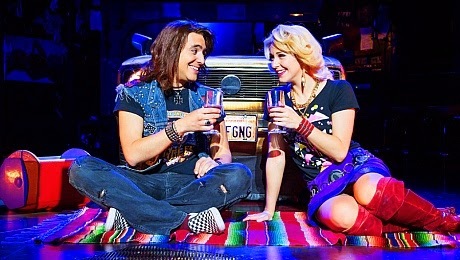 The rock musical is based on classic hits from the period, with the hair and outfits to match. The show throws you with a jolt into 80s Hollywood, where music, women and drugs flow freely hand in hand. From the start the show is an inferno of colour and music. The Bourbon Room provides the setting on Sunset Strip, nestled amongst a hotbed of catastrophe. Sherrie (Cordelia Farnworth) is the small town girl who wants to make it big in Hollywood, landing a job at the Bourbon and there encountering Drew (Noel Sullivan), with the two falling in love (they don’t tell each other, of course). The bar is facing troubling times, with the funny-men of the show, property developers Hanz and Franz, threatening to close it with the aim of ‘cleaning up’ the Strip. Here, enter rockstar Stacee Jaxx to save the day. Ben Richards swaggers to perfection in the role in such a Bon Jovi-esque fashion with Wanted Dead or Alive. With a voice and moves to match, he captured the essence perfectly. Throughout, there is much raunchy dancing and crude jokes, but they err so far on the side of well-delivered that they had the audience in hysterics. The show is funny and direct, particularly in the capable hands of the narrator, Stephen Rahman-Hughes playing Lonny, who allowed the proceedings to flow via immaculate comic timing. Sullivan and Farnworth bring Drew and Sherrie's tentative love story to life with real heart and their soaring vocals electrify the audience. It is in their moments of separation that the show particularly shines with a touching solo of Mr Big’s To Be With You. Here, all debauchery is swept away in favour of tender emotions and stunning vocals. 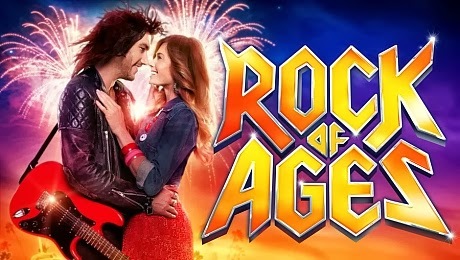 Rock of Ages has a fire in its belly and a humour that differs from Mamma Mia-esque offerings, allowing it to be endearing and sarcastic all at once. 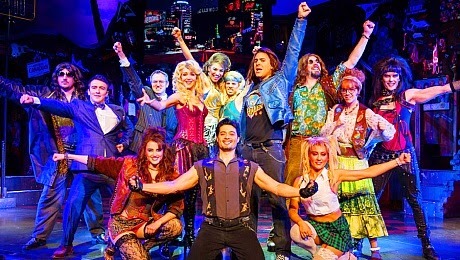 The show is a spectacle for old and young alike bringing a fun factor that surpasses any preconceived ideas you may have (it’s the kind of enjoyment that involves the desire to head bang and do your best air guitar impression), with a highly talented cast creating the perfect embodiment of 80s hedonism. Even the greatest of skeptics could but resist the urge to stand and clap in unison to a chorus of Journey’s Don’t Stop Believing as part of the finale. It is the perfect end to a show promoting ambition, and appropriate in the display of older music loved in a modern context. And loved it most certainly is.